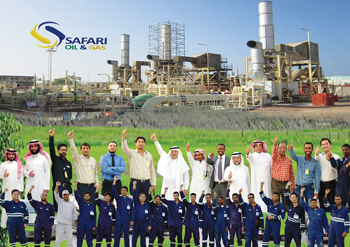 Saudi Arabia-based Safari Oil & Gas, a subsidiary of the diversified Safari Group, is celebrating 10th anniversary this year, with key projects to its credit and significant expansion plans in the pipeline. A pioneer in the provision of pipeline corrosion solutions using non-metallic composite wrapping, Safari Oil & Gas has expanded into other areas of oil and gas and petrochemical industry services. It also plans to set up manufacturing facilities within the Kingdom of Saudi Arabia in partnership with its foreign suppliers, in line with the Kingdom’s Vision 2030. Safari Oil and Gas was established with the intent to venture into the oil and gas services, products and other works and, thus far, has been successful in realizing its goals, said CEO Mohammed Al Ghosain, in an interview on the sidelines of the Middle East Process Engineers Conference (Mepec) and Exhibition in the Kingdom of Bahrain last month. 'We started building up Safari Oil & Gas slowly, and it soon became a specialist in innovative solutions that aim at preventing external corrosion of oil and gas pipelines using non-metallic composite wrap. This innovative technique used in the Kingdom of Saudi Arabia is a good example of the value we bring to our work based on leading practices and advanced solutions being applied around the world' he said. Conventional repairs require costly shutdowns or welding sleeves, whereas non-metallic composite repairs can be implemented online with no downtime, and no hot work. These repairs safely and economically keep facilities running and avoid unplanned outages even with the most severe cases of corrosion, bad welds, cracking, or other anomalies in piping, tanks, and pressure vessels. The composite wrapping technique for pipeline repair has gained acceptance by the operators and owners of hydrocarbon facilities in recent years and they have realised that it is a very cost-effective method of prolonging the life of their facilities, enhancing safety and avoiding ruptures and leaks, continued Al Ghosain. In any pipeline repair -using this method, applicators-who are certified by the manufacturer or a certified trainer, must follow the industry’s engineering standard as specified by the American Standard for Material Engineering (ASME) that prescribes which equation to use the composite wrap to effect a repair on a severe wall thickness loss or to preventing ruptures as a result of internal corrosion or other defects. It requires a lot of engineering and design work, as well as meticulous verification & validation,' he added. Al Ghosain said that in Saudi Arabia the technique has been used for the last five to seven years and the major user for it is Saudi Aramco & Sabic. 'Basically, Saudi Aramco is using it for pipeline road crossings. Once you put a pipeline through a road crossing, you want to make sure that the surface area of the pipe in the road crossing does not become exposed to external corrosion or pitting, which may eventually result in a rupture. We are one of the companies approved by Saudi Aramco to carry out composite wrapping of pipelines for horizontal directional drilling (HDD) road crossing and for micro tunneling' he added. The other widely used application of this technique is for the repair of existing installations that are experiencing severe metal loss of the wall thickness, because of internal corrosion. Application of non-metallic composite wrap restores the strength of the pipeline past the original specifications', said Al Ghosain. Asked how many years the repair will last, Al Ghosain affirmed that it is as good as the user wants it to last, though the industry considers it as a temporary one. 'When pipeline loses some metal, you will need to plan shutdown to replace the corroded section of the pipe, which may adversely affect your operations. the type of repair we provide, however, could last more than 10 years. There are cases, in other parts of the world, where it lasted even 15 or more years,' he said. Safari Oil and Gas is the sole representative of US-based Citadel Technologies for Saudi Arabia, which is a leader in composite wrap manufacturing. 'In fact, their product stands higher than any similar product in the market today, because of the high level of tolerance it has for temperature. Citadel Technologies have a strong technical support and R&D team and they continually improve the characteristics of their product. They are a very reliable supplier, who provides unlimited support for both engineering design and supply to Safari Oil and Gas,' said Al Ghosain. Safari Oil & Gas is also the sole distributor in Saudi Arabia and the Gulf region for a new metal gasket with disruptive technology called Delta V-Seal from Pipeotech Norway. It is a high-end sealing solution for high temperature, hydrocarbon and steam appliances. This product is very effective in sealing between flanges wherever hydrocarbons, high temperatures and steam are present. 'We are now marketing this to our major clients and have seen keen interest from major companies. This is going to change the use of gaskets in the oil and gas, water, power and manufacturing industries. We believe it adds value, it stops leaks and fires and is considered a sustainable product because it helps protect the environment by preventing fugitive emissions inside a plant. 'The company’s agreement with its Norwegian partner envisages setting up a manufacturing unit for the gaskets in Saudi Arabia. 'We expect to set up the facility in two years,' said Al Ghosain. Another business Safari Oil & Gas is entering, now, is the subsea inspection and services, including cathodic protection, subsea coatings, marine growth removal, tank cleaning, internal coating, fire proofing of structures among other functions. The company is also looking at bringing in new technologies from Spain and Germany, that will enhance the weld overlay for pipelines. 'We have started negotiations with several companies and we are evaluating the feasibility as this is considered an expansion of our business. If an agreement is concluded, the needed manufacturing and fabrication facility will be set up,' said Al Ghosain. Al Ghosain joined the Safari Oil & Gas in January of this year, after retiring from Saudi Aramco, following four decades of service, more than 25 years of that in the oil and gas industry itself. He hopes to put the skills and experience he gained while working at Saudi Aramco to good use in the private sector and in helping build the national economy. 'I have been fortunate to work in all areas of Saudi Aramco, but mostly in the downstream and services part of the oil and gas industry. My aim is to bring to the kingdom new technologies that adds value. increases local content and also helps create jobs for Saudi engineers and skilled technicians. I accepted this job because it provides me with a means to spread the ethics, values, standards and professionalism that Saudi Aramco had taught me, and to contribute to the growth and development of our private sector. Likewise, I urge every Saudi Aramco retiree to use the experience he, or she, gained working for Saudi Aramco in the private sector, so that we can help our local communities, and, in fact, our country develop and fulfil the goals of Vision 2030 to its full magnitude', he added. 'My goal is to expand the business of Safari Oil and Gas, and, so far, I have been successful in bringing new partners to the company, and gaining exemplary trust from our clients. Now, we are known in the industry for reliability, the quality of our performance and the speed of our response. We respond to our customers’ needs 24/7 and we assure them that we are out there for them, no matter what it takes.